Can jaundice (high bilirubin levels) and kernicterus cause cerebral palsy? Jaundice, the yellowing of the skin caused by a buildup of bilirubin (the product of red blood cell breakdown) in a baby’s blood and tissues, is often harmless when treated properly. However, when the level of bilirubin in a baby’s blood rises to a dangerous level, bilirubin can enter brain tissue. Bilirubin is toxic to brain tissue and can cause kernicterus encephalopathy, a non-reversible form of brain damage that is associated with lifelong disabilities such as cerebral palsy, seizure disorders, and hypoxic-ischemic encephalopathy (HIE). Newborn jaundice occurs when a baby has too much bilirubin in his or her bloodstream. Bilirubin is an end product of red blood cell breakdown – a naturally occurring process in both babies and adults. Approximately 1% of an adult’s red blood cells are broken down each day. Generally, the liver processes the resulting materials, and bilirubin is safely excreted. Babies, however, have many more red blood cells than adults, as a result of their transition from the womb to the external world. Fetal red blood cells have a short lifespan and are broken down rapidly in the newborn period, often resulting in an excess of bilirubin in the blood and tissues of newborns.. Newborns have a harder time excreting red blood cells byproducts than adults; this further contributes to the unsafe build-up of bilirubin. Due to these factors, many newborns often show signs of jaundice (yellow skin or eyes, poor feeding, lethargy, etc.) shortly after birth. How does jaundice cause kernicterus and cerebral palsy? Any deficiency or syndrome that either 1.) makes it harder for a baby’s body to remove bilirubin, or 2.) increases the number of red blood cells that are broken down. Athetoid/dyskinetic cerebral palsy is characterized by variable muscle tone – both stiffness and limpness – mixed with involuntary motions. Children with athetoid cerebral palsy have trouble holding themselves in the upright, steady position needed for sitting or walking, and often show spastic motions. Some children with athetoid cerebral palsy have trouble with fine motor skills, it may take a lot of work and concentration to move their limbs into a desired spot (like scratching their nose or reaching for a toy). Dystonic cerebral palsy causes symptoms such as involuntary muscle spasms and slow, rhythmic, twisting movements. The condition is distinct from spastic cerebral palsy (the most common form) because those with dystonic cerebral palsy switch from a floppy and loose muscle tone to a tight one, whereas those with spastic CP only experience tight muscle tone. Dystonic CP can also cause difficulty controlling the tongue and vocal cords. Treatment for the condition usually involves a variety of medications and sometimes botulinum toxin (Botox). Hyperbilirubinemia is very easy to detect and treat. For this reason, no baby should develop encephalopathy, kernicterus, or any form of brain damage from untreated high bilirubin levels. Failure to treat jaundice is almost always medical malpractice. At a minimum, a baby’s bilirubin level should be checked every 8-12 hours in the first two days of life and again before the baby is 5 days old to keep an eye on the development of jaundice. Bilirubin levels can be checked using a transcutaneous monitor, which is a light meter placed on the baby’s head. If the transcutaneous bilirubin level is high, a blood test will be ordered to obtain the total serum bilirubin level, a more accurate assessment of bilirubin. If the serum level is high, the baby will likely receive treatment. Repeat blood samples will be taken to ensure that the treatment is working and that bilirubin levels are decreasing and becoming normal. In addition to this standard protocol, babies with risk factors that increase their chances of hyperbilirubinemia, kernicterus, and cerebral palsy should be monitored more closely. Oftentimes the threshold for treatment is lower for babies with these risk factors, and action must be taken earlier to prevent long-term damage. The main line of defense against jaundice, phototherapy, involves placing a baby under special lights that decrease bilirubin levels. A fiberoptic therapy blanket can also be used for the same effect. In more urgent cases, the physician will do a blood exchange transfusion to normalize blood bilirubin levels. During an exchange transfusion, the baby’s blood is slowly replaced with donor blood. Jaundice, Kernicterus & Cerebral Palsy: When Is It Medical Malpractice? It is very important for physicians to remember that when clinical signs for bilirubin-induced brain damage occur, it is not too late to treat the baby. This is because when an infant is jaundiced and signs are present, damage is continuing to occur. The sooner bilirubin levels are reduced, the less severe brain damage will be. Abnormally high bilirubin is a medical emergency, and delay makes damage worse. Postponing treatment or interrupting phototherapy for diagnostic testing. If a test is needed, it can be done under the lights. If the baby needs to go for an outside test, the lights can easily be moved with the baby. Not believing the bilirubin level from the lab, and delaying treatment while it is repeated. It is okay to repeat the test, but treatment should not be delayed while waiting for the repeat test. There are no negative effects of treating with a large dose of phototherapy, gavage feeding (feeding through an NG tube), and hydration, or of ordering a type and cross-match of blood to prepare for transfusion. Failing to perform an exchange transfusion in a timely manner. Using the indirect bilirubin instead of the total serum bilirubin to make treatment decisions. Total bilirubin level should be used. Letting the bilirubin reach potentially dangerous levels. Measuring bilirubin and failing to compare it to hour-specific norms. This is very important. A bilirubin level in a one-day-old may be normal or dangerously high depending on whether the baby is 24 or 47 hours old. Causing or or contributing to the jaundice through improper use of forceps or a vacuum extractor at birth. Lack of policies on when to check bilirubin levels, especially in premature babies and other at-risk infants. When physicians and the medical team act negligently and fail to follow standards of care in diagnosing and treating high levels of bilirubin, it is negligence. If this negligence causes cerebral palsy or other forms of brain damage in a baby, it is medical malpractice. Birth injury is a difficult area of law to pursue due to the complex nature of the medical records. 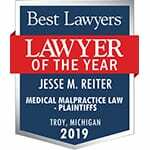 The award-winning birth injury attorneys at Reiter & Walsh ABC Law Centers have decades of joint experience with birth injury and cerebral palsy cases. To find out if you have a case, contact our firm to speak with one of our attorneys. We have numerous multi-million dollar verdicts and settlements that attest to our success, and no fees are ever paid to our firm until we win your case. We give personal attention to each child and family we help, and our award-winning attorneys are available 24/7 to speak with you.